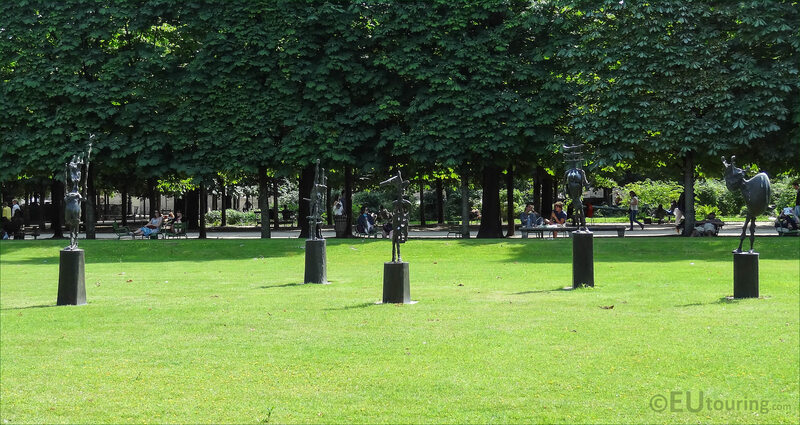 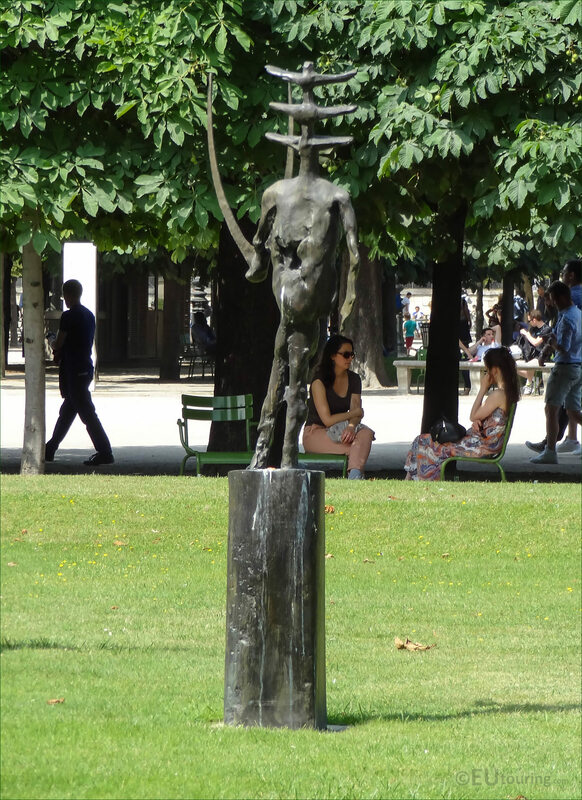 These particular high definition photos shows a sculpture group called L'Echiquier, Grand, which were produced by Germaine Richier and are located within the Jardin des Tuileries in the 1st Arrondissement of Paris. 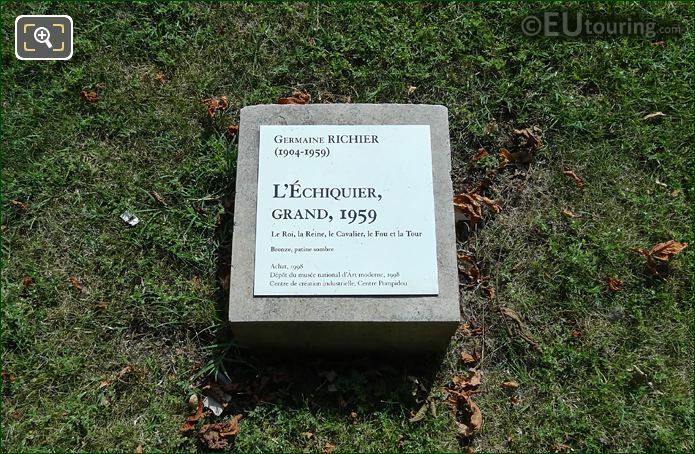 This first photo shows all five sculptures that comprise the group called L'Echiquier, Grand, which in English translates to The Chessboard, Large, and classed as modern art or contemporary art, these were produced back in 1959. These particular statues are cast in bronze with a dark patina from the original plaster works that were completed in 1959 and exhibited at the Galerie Henri Creuzevault in Paris in an exhibition dedicated to the artist Germaine Richier. 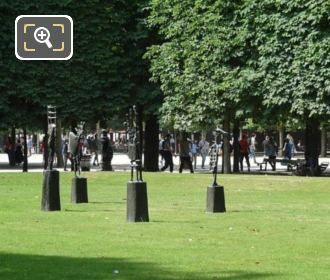 As you can see, l'Echiquier, Grand statues are positioned on top of pedestals of varying heights and they were sculpted to depict main pieces of a chess set including le Roi, la Reine, le Cavalier, la Tour and le Fou and in English these translate to the King, Queen, Knight, Castle and Bishop. 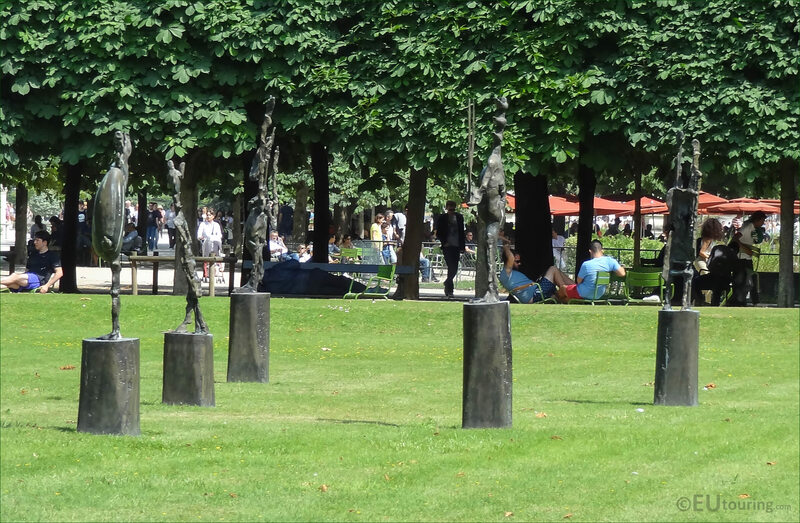 Although this next HD photo shows three of the bronze Chessboard, Large sculptures, which we took looking at a side on view, and even though these were initially based upon a small chessboard sculpture the artist had produced a few years prior, these turned out completely different. 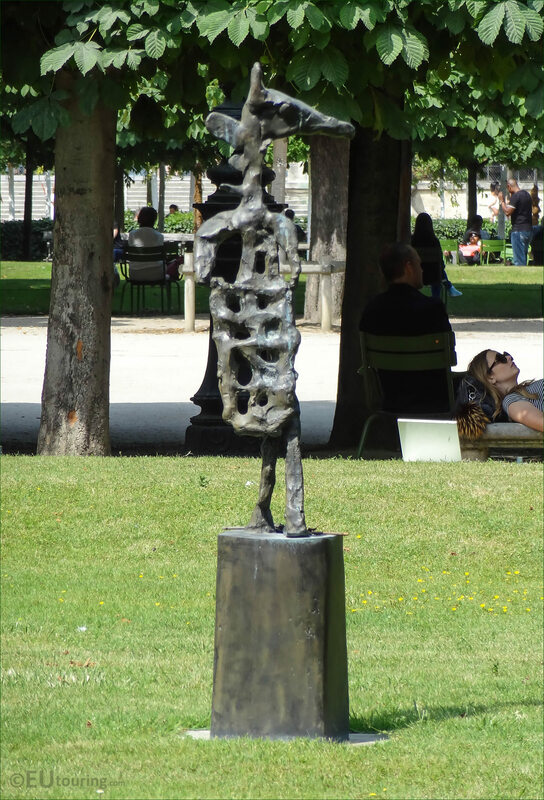 Talking of the artist, Germaine Richier was born in southern France in 1902 and initially studied at the Ecole des Beaux Arts in Montpellier to become a French sculptor, then went on to work with Antoine Bourdelle at his studio until he passed away in 1929, yet during World War II she was in exile in Switzerland before returning to France. 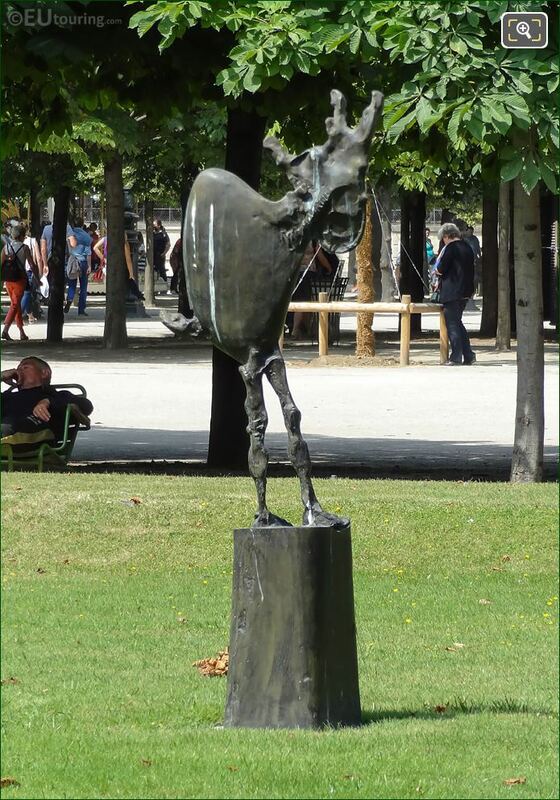 You will find that the modern art works Germaine Richier produced were an interpretation based upon a mix of human and animal traits, which became more abstract in their forms as time went on, and this close up photo shows the bronze chess piece referred to as the Knight, or Cavalier in French, which she started to work on after feeling better, having been plagued by illness for two years. 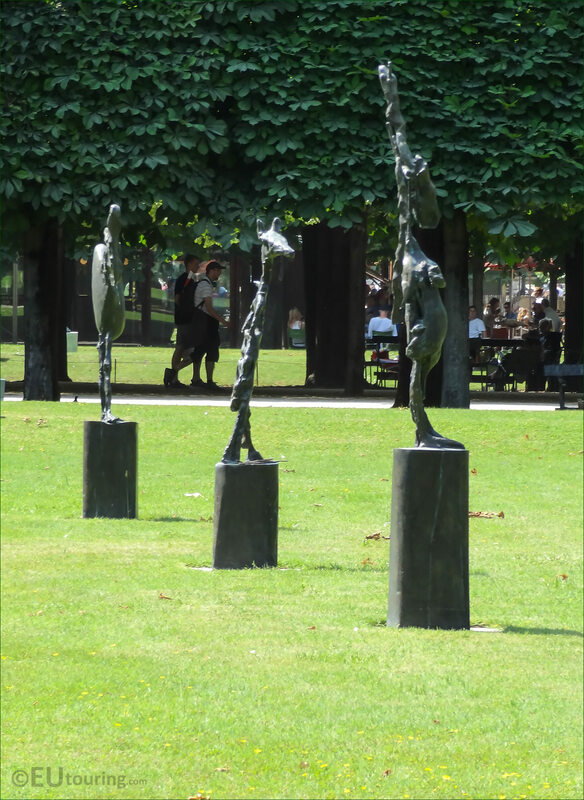 And it was with the help of artist Robert Haligon, that she was able to get her plaster sculptures of the five chess board characters ready for the exhibition, prior to any casts being taken in bronze, and these, which were painted are now held at the Tate Museum in London, UK. So this next high definition photo shows a close up of the bronze statue with its dark patina known as Le Roi, which in English translates to The King, and as you can see the top part actually resembles fish bones rather than a pure human figure, and this is the second tallest of the five sculptures in the composition called L'Echiquier, Grand. Yet unfortunately, after the display of the plaster sculptures, Germaine Richier fell ill again and passed away in the July of 1959, so she never actually experienced the international recognition that this work of art gained, yet several bronze casts are now found in different countries throughout the world. 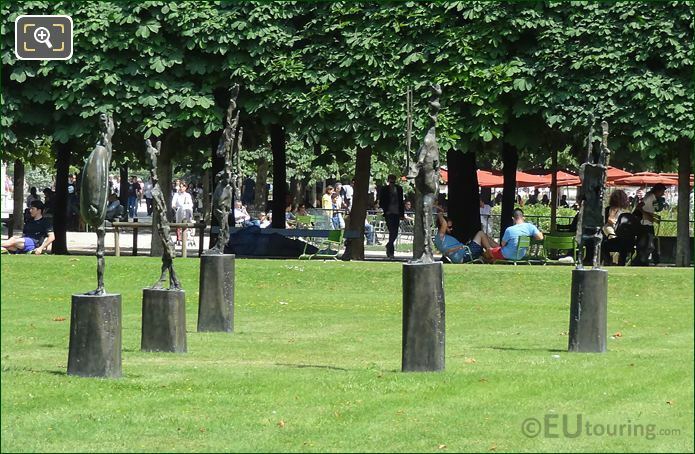 In fact, the bronze casts can be seen in cities such as Oslo, Hamburg, London and of course Paris, and in this photo you can see the one statue of The Chessboard, Large that was designed as the Bishop, or Le Fou in French, and this particular composition was acquired by the Pompidou Centre in 1998 as a deposit of the National Modern Art Museum. 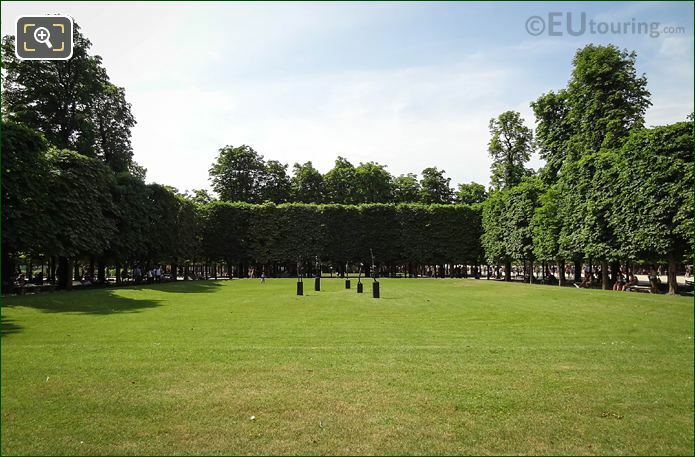 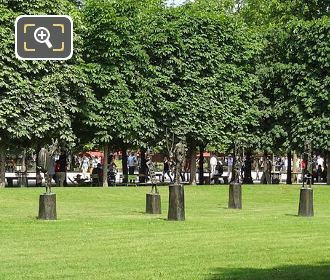 However, L'Echiquier, Grand was installed in the Jardin des Tuileries, within a parterre of the Grand Couvert area of the garden in the year 2000, which is where we were when we took these high definition photos. And although Germaine Richier was not well recognised during her lifetime, her works now command a high price when they go up for auction, yet one piece caused a major controversy with her creation of a modern art statue of Christ that was meant for a church. 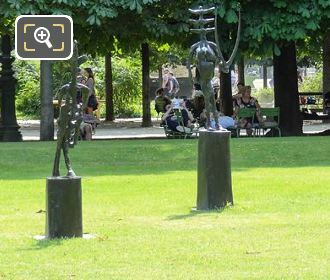 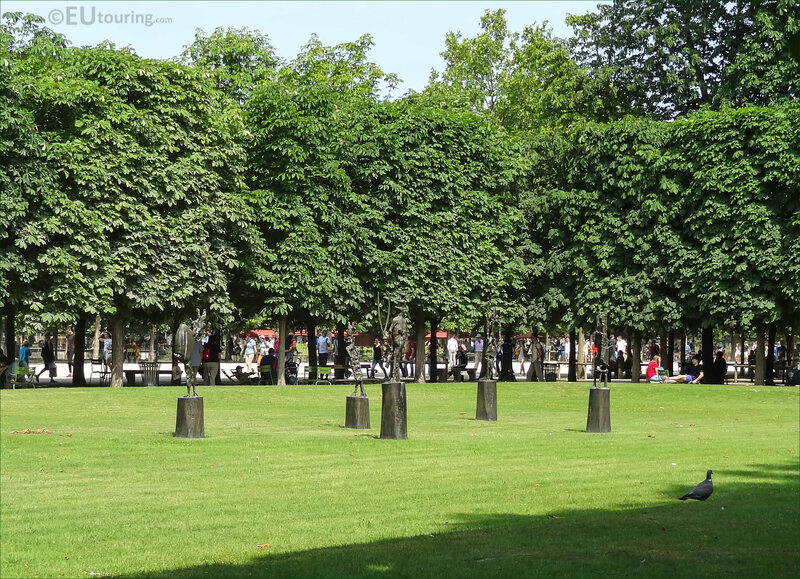 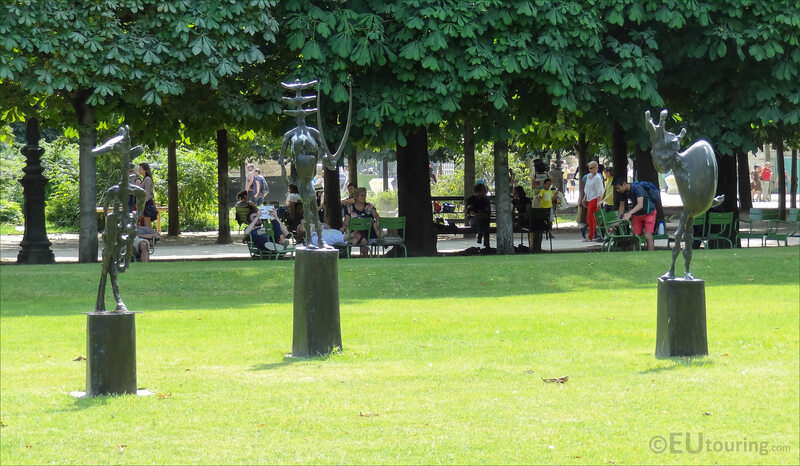 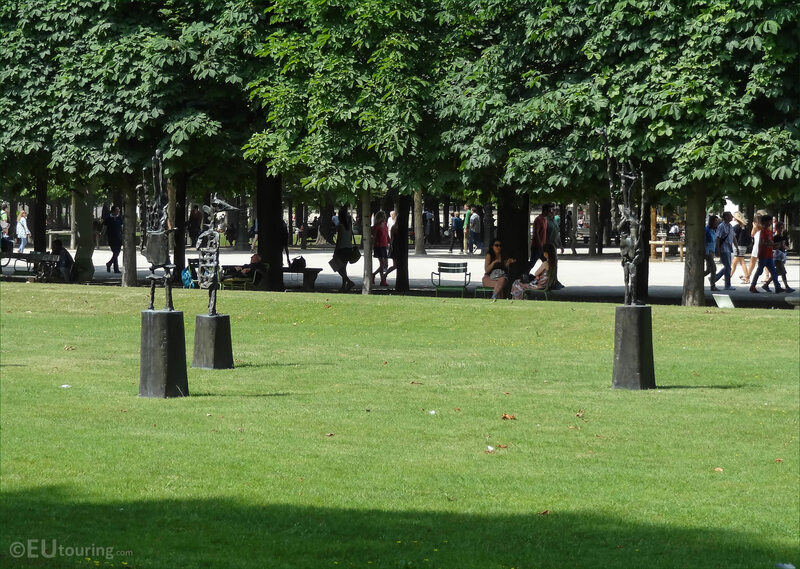 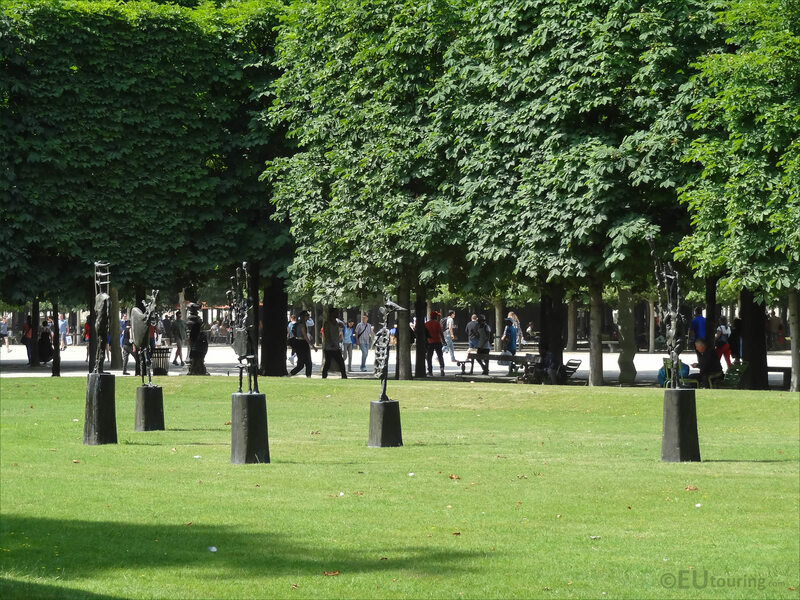 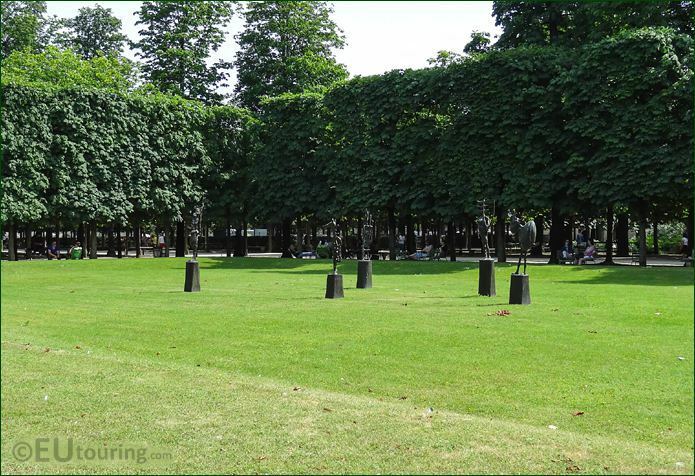 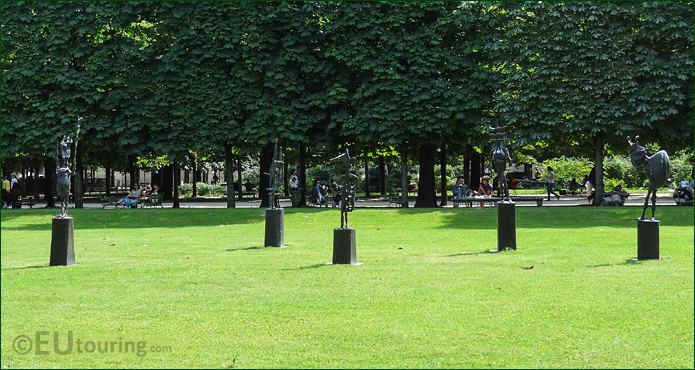 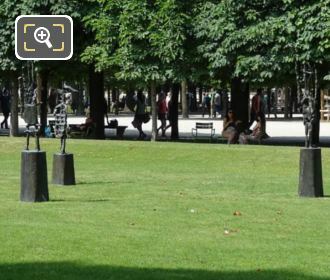 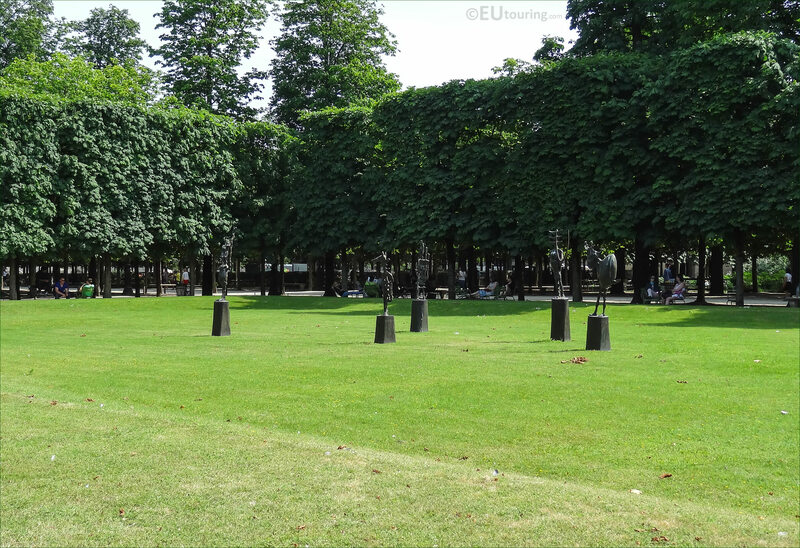 But here you can see a close up photo of the plaque positioned on stone on the grass parterre next to the path that overlooks the green and these bronze sculptures within the Jardin des Tuileries, although, as you can tell, and we mentioned prior, they were within the Pompidou Centre in Paris. Germaine Richier has been quoted as saying "All my sculptures, even the ones from my deepest imagination, start from something true, from an organic truth", and this certainly seems to be the case with this unusual and very imaginative sculpture of the Chessboard, Large. 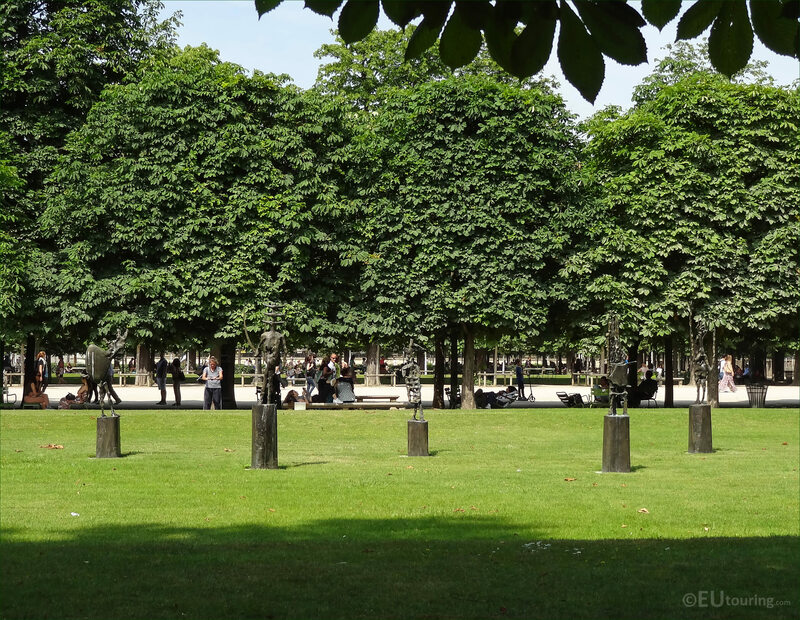 Now you will find that there are many areas within the historical and popular tourist attraction of the Tuileries Gardens where you are not allowed to walk on the grass, so as you can tell, sometimes the sculptures like this one of L'Echiquier, Grand are positioned quite a way from the edges where free seats are laid out for people to relax.